Yesterday at the hospital, I practiced changing out the g-tube on a doll who had a hole drilled into her stomach so parents like me could practice on her. 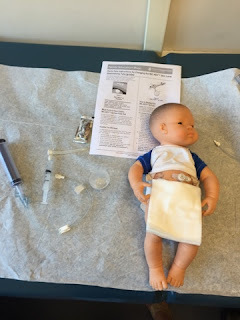 Basically this involves deflating the balloon inside the g tube apparatus sitting inside the stomach, pulling out the whole apparatus, and quickly inserting a new g tube apparatus and inflating the balloon with a certain amount of water. Preferably when her stomach is less full so not as much of the stomach contents spill out. This is way less scary on a doll! Ah, the glorious life of a tube mom! I hope I don't have to change it anytime soon. 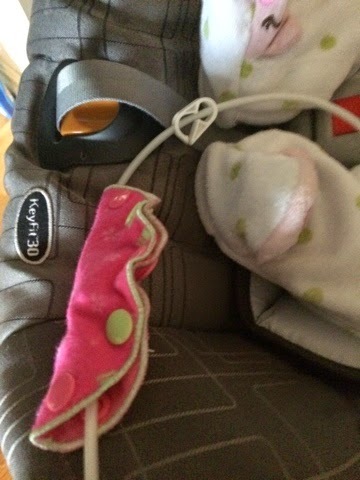 These have to be changed every 3 months or when she grows too big for her current size g tube. I am also well-versed now with accessories for Evie's tubie life. Who knew there was a market for G-tube accessories--belts, stickers for the food bag, g-tube doll buddies to help kids not to feel alone, bags for the ice packs, etc. The Feeding Tube Awareness site is definitely the best place to start for a comprehensive list. There is also a good presence of Tubie accessories on Etsy.com. 1. Let's start with fashion! How do you dress your child in a cute piece of clothing if she has a g-tube that needs access? I definitely find that sleepers with the snaps are much easier for accommodating and allowing access to the g tube. I'm sad that she hasn't been able to wear anything with zippers on the front. Carters had snap front rompers for the summer, and I bought as many of these as I could! For regular dresses, I anchor the g tube with a grip-lol tape on her side, and then tuck the tube through her bloomers. Tummy Tunnels: these are good to put on onesies, but not sleepers. I ruined a perfectly nice sleeper because I put a tummy tunnel on it and created a hole for the g tube but then Evie just sat around with a nicely dressed hole in her clothes. For a zippered sleeper, snip a hole on the seam in the crotch or down the leg. I'm guessing we won't be including these in our hand me downs! We did this with our Zipadee Zips and they work great! 2. 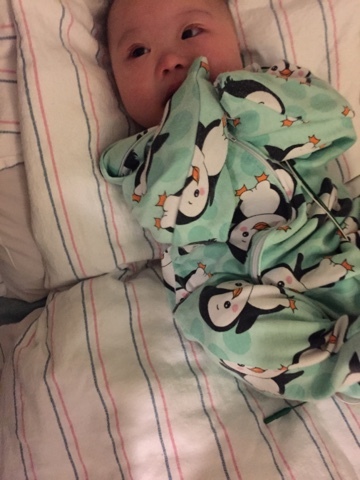 How the heck can I go out with my baby if we need to be hooked to a G-tube every 5 hours for 90 minutes at a time? When Evie was about 3 months old, I saw a woman in a hospital waiting room feeding her son by G-tube with a little lunch cooler next to her. I asked her about it, and she showed me the G-tube bag nestled in the cooler with an ice pack, and another pocket with the pump sitting inside. I was so excited to see this. IV poles don't exactly travel well. So I went to Target and bought my own lunch cooler. That was our first travel bag. I also found a seller on Etsy who adapts kids' backpacks for g-tubes. I found a penguin backpack on her site and I was in love. 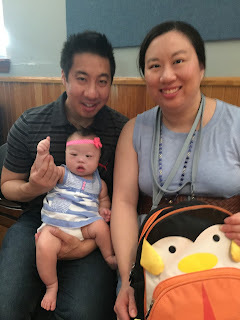 Now Pepe the Penguin backpack goes where we go! 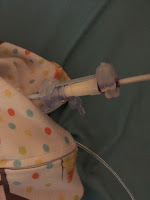 Pepe gets equipped with a g-tube bag full of formula, and the tubing gets threaded through to the front pocket, which hooks up to the g-tube pump that regulates how much food she gets. An ice pack keeps the formula fresh. 3. How can I keep the G-tube from disconnecting from the extension tube? We originally used the CORI box, which was invented here in Boston for a girl named Cori. But then the length of the catheters were changed, and now our box doesn't fit anymore. I hear that they are working on a new version. There are also cloth versions on Etsy, but they don't do much except keep things from rubbing up and accidentally dislodging the connection. If any pulling happened, this wouldn't be very helpful. I learned that the hard way in the car. My latest find came out of desperation when the length of the bag catheters got longer. 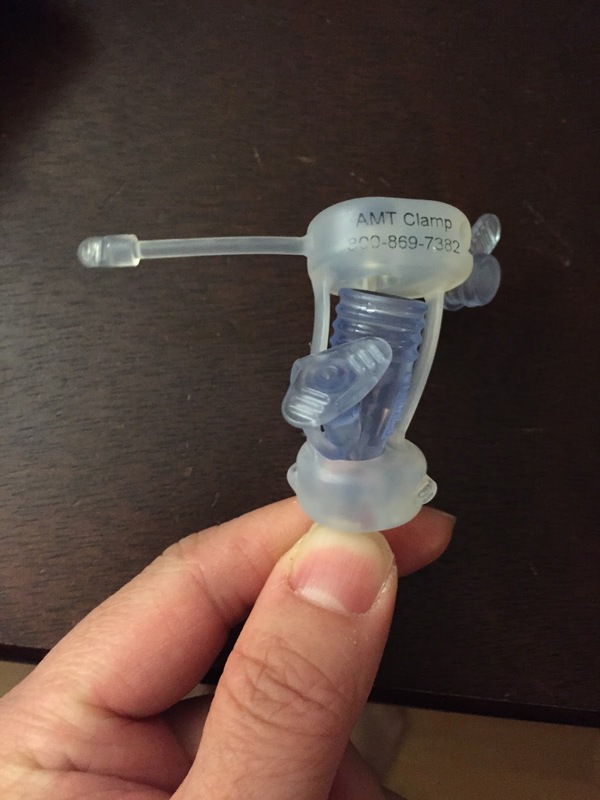 That's when I found the AMT clamp, which is harder to put on, but definitely more secure than the others, and allows med port access at all times. Our medical supply company provides this for us. 4. Can the G-tube button come out? Yes. We were told to take her to the ER asap if this happens, because the hole can close in 2 hours. As kids get older, it's hard to keep them from pulling on the button or tube, so we would have to purchase a protective belt if she has the g tube a bit longer. There are lots of cute handmade protective belts on Etsy.com if you search for G-tube belts. 5. How long will Evie need her G-tube? We don't really know. It's up to Evie. The hope is that now that she had had heart surgery, she will gain strength and not burn so many calories by eating, and re-learn to eat without being so tired. As she eats more and more orally, we can wean her off the g tube. I have read about kids developing feeding and swallowing issues like oral aversions, so I am glad that Evie still likes to eat from the bottle, and we will continue to reinforce that. I've talked to several moms who've done it, and some took 2 months and some took 3-5 years. They all said there were ups and downs, but gradually they got the hang of it. There is a feeding team at Childrens Hospital to help us, and Early Intervention as well. That's the G-tube lesson of the day! If anyone has other questions, I'm happy to answer them! 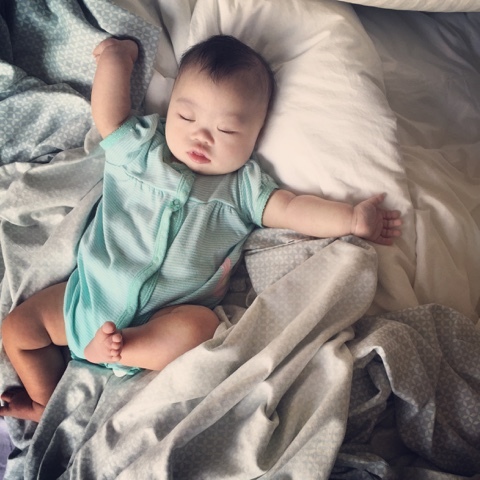 A very good resource is a blog by a tubie mom at Feeding Raya. She has awesome tips for troubleshooting, as well as telling about her own experience. So great to know! You & Evie are the cutest! my friend invented this sleeve for her daughter. I do think it can work for g-tubes! Thanks for the links, Cookiegal! I will check it out! We won't be seeing you later, Ollie! Happy 1 month Heart Day!